Vegas is a fun and vibrant city that has so much to offer residents and visitors alike. Though it’s known all around the world for its amazing casino scene and wild club crawls, Las Vegas is also known for its plentiful choices in exciting and lively nightclubs that serve drinks of all types. Adults who drink responsibly can have a lot of fun. However, it’s always critical to take things slowly. Try to refrain from drinking more than a single alcoholic beverage each hour. Going overboard can lead to negative consequences. Your goal should be to remain alert, vigilant, and in full control of yourself at all times. Nightclubbing isn’t a competition. There’s no need to try to outdo anyone else in the drinking department. Pace yourself and enjoy yourself the safe way. 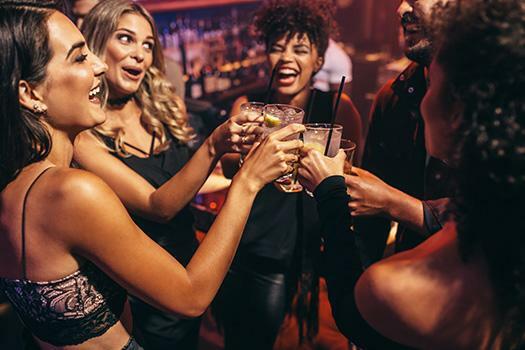 If you’re clubbing in Las Vegas, chances are you’re around friends who are doing the same thing, which is why it’s a good idea to learn how to recognize the key symptoms of alcohol poisoning. Signs of this potentially serious condition include a bluish complexion, vomiting, pale skin, cold skin, and breathing difficulties. If you’re unable to wake a friend who passed out, this may indicate alcohol poisoning as well. People who have alcohol poisoning require fast medical attention. Never go clubbing on an empty stomach. It doesn’t matter how busy your day is. Make a point to eat something prior to hitting the Sin City clubs. Eating in advance can delay alcohol absorption. If you eat before drinking, the alcohol won’t access your bloodstream as quickly. A fast and easy peanut butter and jelly sandwich can go a long way for people who want to stay safe while clubbing in Las Vegas. A little food will give you more energy to dance the night away as well. It’s a lot of fun to receive free drinks from other people. However, it can also be extremely risky. If you want to stay safe while drinking at nightclubs, make the effort to buy your own adult beverages. Don’t give anyone else the opportunity to do so for you, and stick around while the bartender makes your drink. You want to make sure you never drink alcoholic beverages that contain any potentially unsafe substances. Clubbers frequently enjoy drinking out of punch bowls. This is never a good idea because you can’t know exactly what’s inside of them. If you want to be 100 percent safe, you should stay as far away from these mystery bowls as possible. After all, nothing matters more than your safety and wellbeing. Another way to stay safe when hitting the hottest clubs in Vegas is to take a party tour bus. Las Vegas is home to many killer clubs, and Turnt Up Tours offers VIP access to some of the most popular spots. Book a tour on our website or give us a call today at 702-843-0525.